Are you the right fit for the finance industry? The finance industry is a highly desirable area of work, and consequently a competitive sector to make your first step into. Employers in the industry have outlined key things they look for in candidates; there are variations between different finance professions but there are a number of core skills that are required unanimously across them all. Before putting all your efforts into cracking into this industry, it is crucial to establish whether you have these skills. One of the most common of these is the ability to think analytically and solve problems. If you are naturally inquisitive, the finance profession could be a great place to test your skill of finding solutions to complex problems. Alongside this, many firms are interested in candidates that can show imagination, which goes hand-in-hand with the logic needed in this industry. Employers will be keen to see evidence of both confidence and interpersonal skills in candidates, as having the confidence and ability to interact well with clients is crucial. It is a given that at interview you’ll be asked to provide examples of a time when you have demonstrated these qualities, so brainstorming specific occasions is a helpful exercise to have done in advance. It’s not only specific skills that financial employers look for, but an understanding of and passion for the sector. This displays a candidate’s enthusiasm and commitment to a career in the industry. Candidates should also show strong levels of commercial awareness, understanding the latest trends and issues to hit the financial sector. To really shine you’ll need to take it one step further, it is important to form opinions on these and voice them; showing a genuine interest in financial markets. To gain a better understanding of how students enter the finance industry, have a read of the Inside Careers employee profiles, including one from an Exeter alumnus, who interned at RBS. 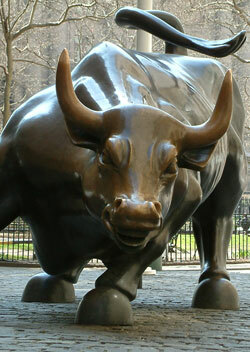 To find out more about a range of careers in finance, head on over to the Inside Careers website. 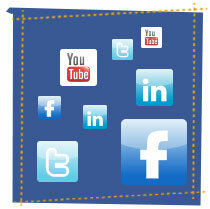 Facebook, Twitter, You Tube, Pinterest – these are all social media platforms you use for fun right? Well yes definitely, but have you also explored how they can help you in your job hunting? 1. What Happens in Vegas Stays……..on You Tube….Facebook….Twitter…. We all know the importance of maintaining a good presence online yet some students are still finding themselves getting into problems with posts they (or others) have made about them online. Remember employers may check what information there is about you online before you join and have been known to withdraw offers based on things they find. So what can you do to protect yourself? Make sure you lock down your privacy settings and regularly check these as they are often updated, meaning that things you thought you had secured may have become open to the public again. Google yourself – check what is already online about you and do this regularly. Clear up anything you wouldn’t want anyone to see if they googled you too. Set up Google Alerts for your name to be informed about anything that is posted about you. Lastly just take a second to think about the effects anything you post may have before putting it online. Having a presence online is not necessarily all negative however and building your brand online can really help you get ahead of the game and stand out to employers for the RIGHT reasons. The more active you are on social media sites, the higher you will come in the Google rankings. Even just having a LinkedIn account (we’ll come on to that later) can help you get to the top of a Google search, so get involved! Blogs are easy to start up and one of the most popular and easy to use is Word Press. But how will blogging help you with your career? Well for a start you can use it to demonstrate your knowledge of certain areas, interest in a topic or skill sets. For example if you were interested in becoming a journalist your blog can show your writing ability. Or say if you wanted to get into Marketing, you could blog about your views on various marketing strategies you have come across in the media or any you had personally created. The great thing then is that you can add a link to it on your CV or LinkedIn account to demonstrate more about you. Make sure however that you update your blog regularly otherwise there’s no point. They may stalk you online but you can also do the same, so get proactive. Go to the employers website and find out which social media sites they use. Some may have separate sites for careers related information so always go onto the recruitment section of their website first to check. If you them on Facebook and follow them on Twitter you can then get regular updates on job openings/events/company information etc, all from the comfort of your own Facebook/Twitter homepage. You Tube can also be a great way to find out more about the company and the various roles within it from current employees or recent graduates. Some employers will also post clips on how to succeed in their recruitment process and what a group exercise might look like. Interact with them – don’t be afraid to ask them a question or get involved in discussions. This can help to get you known to the employer so make sure this is for the right reasons. Make sure the questions you ask couldn’t easily be found out from their website or recruitment literature otherwise it will look like you haven’t done your research! Time – It can take some time to start reaping the rewards of LinkedIn so be patient and know that the more time and effort you put into it the more benefit you will get from it. Networking – Start connecting with people. This can be other students, friends, contacts, employers you have met, work colleagues etc. They may not necessarily be connected to the area you want to get into but they may know someone who is! You can even search for particular companies and then find relevant people within that company you may like to approach. Make sure when you send out your request to connect that you change the generic text box and target it to that individual so they are more likely to connect with you. Profile – LinkedIn will take you through the necessary steps to help you set this up and give you pointers on how to improve your profile. Just like your CV it should be targeted to the area you wish to get into. Make sure you detail clearly in your work history the skills and experience you have gained, including key words which employers may search for. Groups – This is a great feature of LinkedIn and allows you to join groups that may be of interest to you. Doing this can help target your profile and enable you to participate in discussions and learn about certain areas. But which groups should you join? Search for ones related to your career area or previous experience. The University of Exeter has a group so why not start by joining that. Professional bodies and company specific groups can also be great ones to join. Is it worth upgrading? There are a few benefits to getting the professional upgrade however the majority of what you need to do can be done without needing to upgrade so don’t feel you have to do this at this stage. More, More, More – If you want to know more why not come along to one of our LinkedIn labs which will shortly be advertised on My Career Zone. In summary Social Media is a great way to open up your job search and help you approach your job hunting in a more creative way. Not only can it help you access that all important hidden job market but it can also help you network and get yourself known to employers. Make the most of it as a resource and be sure to include it in your job hunting action plan. To start on your social media journey why not come along to one of our ‘Focus on Social Media’ sessions in the Forum Exploration Labs or follow the Career Zone on Facebook and Twitter to keep up to date with all things employability. Welcome to the University of Exeter Career Zone blog! Here you’ll find tips, advice and resources on all things career related. Our first post is about two very important resources that you need to know about to help you with your career planning while you’re here at the University of Exeter. 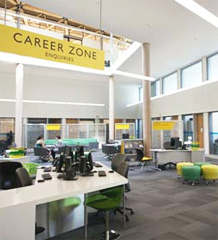 You can access My Career Zone at www.exeter.ac.uk/mycareerzone or you can login from our careers box in the MyExeter Portal. It’s a really fantastic resource, and you can use it for three years after you graduate – so make sure you get the most out of it! Help if you have absolutely no idea what you’d like to do after you graduate! So don’t be shy – pop in and say hello! We look forward to meeting you and helping you start to think about life after Exeter.